Home » Island People » Art, Music, Culture » The Results Are In! Annie Lou in the dining room of Thurston House. It's official. Annie Lou Gaskins bakes the best fig cake. 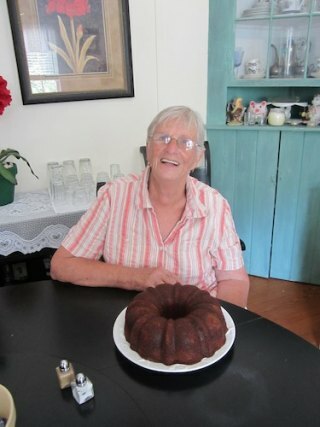 She beat eight other bakers in the “traditional” category at the 1st ever Ocracoke 4th of July Fig Cake Bake-Off. Caroline Slane also bakes the best fig cake. She took the prize for the best cake in the “creative” category, which had five other entries. The Bake-Off was one of many events coordinated by Robin Payne for the Celebration at the Docks in the Community Square. Judges were Kay Riddick, Dave Frum, and James Barrie Gaskill. They gave each cake scores based on four criteria: presentation, taste, texture and figginess. Annie Lou and Caroline received plaques and yard signs designed by local artist Kitty Mitchell. They also won gift certificates donated by the Ocracoke Variety Store and Pony Island Restaurant. Annie Lou and Donna pose with the yard sign. Annie Lou’s cake disappeared quickly on July 4th, but there’s plenty more where that one came from. If practice makes perfect, that could be her secret. Annie Lou bakes a fig cake at least every other day. You, too, can have a slice for breakfast anytime, as long as you’re a guest at the Thurston House Inn. Located on Highway 12, the Thurston House was built in 1925 by Annie Lou’s daddy, Thurston Gaskill, and it’s the house she grew up in. Her daughter Marlene Mathews renovated the house in the mid-90’s and turned it into a bed and breakfast, then added an annex with six more rooms. Another of Annie Lou’s daughters, Donna Boor, bought the inn from Marlene in 2005, and she and Annie Lou enjoy entertaining guests and serving them delicious (and award-winning) fig cake. “We meet people from all over the world,” they said. They’re open year round (though they take some time off in February). Hospitality is in their genes; Annie Lou’s granddaddy owned the famous Pamlico Inn, which was destroyed in the ’44 hurricane. The winning fig cake is a joint effort between mother and daughter – Donna takes the credit for canning the fig preserves! Annie Lou didn’t share her recipe, but did allow that she uses a pint of figs in each cake, not the half-pint that many people use. Caroline Slane with judges Dave Frum and James Barrie Gaskill. Caroline Slane won the award for the best fig cake in the “Creative” category with a recipe she adapted just for the Bake-Off event. She calls it “lemon fig cake” and says it’s a fusion between a traditional fig cake and a gingerbread-lemon recipe that her mother used to make. This was only the 3rd fig cake Caroline has ever baked, and she says she was “shocked” to win. “I only bake at holidays,” she said. “I didn’t think I could compete with the classic bakers who’ve been baking always,” she added, hence the last-minute recipe adaptation so she could enter under the creative category. The lemon flavoring makes the cake lighter and more “summer-y,” she says. She decided to enter the night before the Bake-Off and says the cake was a group effort, crediting her husband, Willis, with the lemon grating. His work paid off, with a plaque for Caroline and a brand new recipe for Ocracoke bakers. Ready to try it? Click here. The Fig Cake Bake-Off committee was comprised of Robin, Trudy Austin, Daphne Bennink, Merle Davis, Chester Lynn, and yours truly. To stir up interest in Ocracoke fig traditions, Daphne interviewed Chester for her radio show, during which he credited the late Margaret Garrish with inventing the first Ocracoke fig cake in the 1950’s. Close-up of plaque with Kitty's lovely artwork. According to Chester, Margaret took a recipe for date cake, substituted fig preserves for the dates, and – voila! – history was made. Before that, figs were used to make preserves and syrup. A pre-50’s fig cake would have been a basic yellow layer cake with fig preserves between the layers, not the dense, dark, moist concoction we enjoy today. For more about Ocracoke fig trees and fig recipes, join Chester at his “Ocracoke Figs” OPS Museum Porch Talk on July 28th at 11 a.m.